In-home health care is a great choice for people battling a chronic disease. The flexibility of in-home visits and the simple sense of control and comfort during treatment are foremost among many reasons patients and their families choose to receive care and treatment at home. During the holidays, the desire to spend time at home becomes stronger and is a great reason why home care may be right now you. Home holiday décor lends a personal touch to the holidays. The simple act of putting up holiday-themed decorations is a tradition that reminds us of why home and family are so important. It’s a chance to reminisce with friends and family about favorite Thanksgiving memories, share family photos, and enjoy a sense of normalcy even in the midst of treatment or chronic disease. Visiting family do not have to make a special trip to see their loved ones. This is particularly relevant for very young children, or family members who find it difficult to travel. Many of us must transit during the holidays to see our families, and in-home healthcare means the family can be together without adding more travel time to or from the nursing home or hospital. Taking a break is easier. When families visit in the hospital or nursing home for the holidays, their loved one’s need for periodic rest or treatment may end the visit prematurely. However, at home, care and rest can be provided on schedule without necessarily sending anyone away early. Imagine the joy of waking up from a restful sleep to warm greetings and smiles from the people who mean the most to you. Families understand each other better when they have the opportunity to observe the medical care of loved ones living with chronic or acute illness. Discussing the challenges and individual needs of an ill family member helps everyone involved to cope better with the difficulty, and be thankful for and support each other. Younger family members gain meaningful insight and learn new ways to adjust their own perspective when visiting an ill loved one during the holidays. In a comfortable home environment, young people are less likely to be frightened by the situation, and so are more likely to learn about the illness, and how to help care for someone who needs special attention. Learning how illness affects their own family members can inspire compassion and empathy in children and young adults as they mature. Thanksgiving is the perfect holiday to visit with family, and reflect on all the good that is possible in life. The support and joy of family not only fortifies the spirit but also helps dissolve invisible barriers of isolation or detachment that is often felt by those suffering from a chronic or terminal illness. In-home care is flexible, customizable, and financially no less constraining than hospital or nursing home care. It also reduces the occurrence of unexpected problems, as patients are encouraged to communicate by phone or email with their healthcare providers. This means that, at Thanksgiving, in-home care patients enjoy the same standard of care as those in a nursing facility but with the added comforts of home and family. 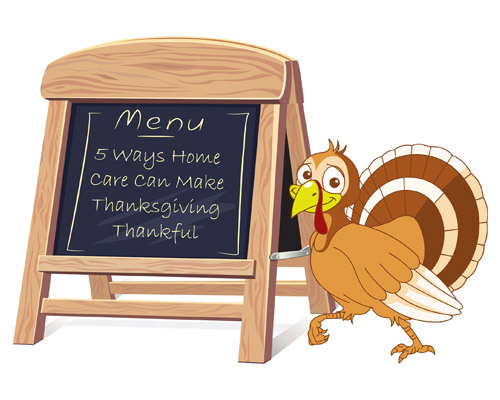 This article was posted in Elder Care and tagged Home Care, Home Health, Thanksgiving.